GreenBiz webinar sponsored by Hitachi Microgrids. 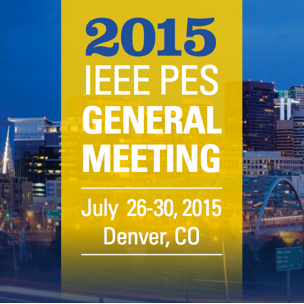 July 28, 2015: IEEE Power & Energy Society General Meeting, microgrid panel moderated by Washington State University Associate Professor Anurag Srivastava. Program included presentations from Microgrid Institute, U.S. Department of Energy, Sandia National Laboratory, Massachusetts Institute of Technology, and National Technical University of Athens. Working guide to project evaluation methodologies, criteria, and other resources (Updated February 2015). Achieving community goals with solar energy, microgrid technologies, and strategic planning and development. This report presents the results of more than two years of research, development, and testing. Project results showed that a multi-zone microgrid control approach – managing distributed solar photovoltaics (PV), energy storage systems, and gas-fired combined heat and power (CHP) units in several independently islanding sub-systems – can effectively ensure the availability of resilient energy supplies in Mid-Atlantic communities. Organized in four volumes, the 160-page report details technical design and configuration considerations for multi-zone microgrid systems; analysis of test results; and examination of regulatory and financial options for public-purpose microgrids. The microgrid control system was built on Green Energy Corp’s open-source GreenBus distributed energy resource control platform. The project included development and integration of GreenBus applications to support system interoperability; low-latency messaging and secure transport; and customizable data automation and control capabilities. The GreenBus platform enabled development of a microgrid control architecture that includes multiple zones capable of autonomous operation. (23 Jan., 2017) San Francisco: When community leaders consider investments in sustainability, resilience, and smart infrastructure, they face a dilemma. Immediate priorities drive a focus on meeting short-term needs, but strategic objectives often require a big-picture outlook.Illustrative examples are found in the sustainable energy sector. These projects are made possible by grants from the New York State Energy Research and Development Authority (NYSERDA) under the NY Prize Community Grid Competition. The Minnesota Department of Commerce, Division of Energy Resources, engaged Microgrid Institute to support a CHP stakeholder engagement process as part of the state's effort to increase energy efficiency in Minnesota. Among deliverables produced for this project, Microgrid Institute prepared several policy brief documents, and sythesis/summary reports. 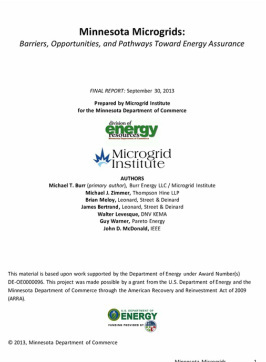 Microgrid Institute June 30, 2015 report summarizes and synthesizes stakeholder comments submitted to Minnesota Department of Commerce during the Draft CHP Action Plan Comment Period, March 30 through May 15, 2015. FINAL REPORT synthesizes comments and findings in the Minnesota CHP Stakeholder Engagement Process and provides recommendations for development of a CHP Action Plan. 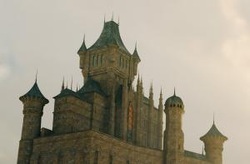 (February 2015). Policy brief document on utility standby service pricing and policies, distributed at CHP Stakeholder Meeting #2 (Sept. 3, 2014). Summarizing various state policy approaches to CHP, including energy efficiency standards, renewable energy targets, and alternative portfolio standards (Sept. 24, 2014). This project was made possible by a grant from the U.S. Department of Energy and the Minnesota Department of Commerce. Community microgrid initiatives reveal simmering conflicts about the role of the utility franchise, versus the free market. Who gets to develop community microgrids? And how will they be financed? Panel 1 of the NYU Law School Symposium on the Utility of the Future addresses market forces and the changing utility industry business model. Microgrid Institute Director Michael Burr addresses drivers for innovation and the role of microgrids. One of the most interesting trends of 2013 was the rise of microgrids. While the hype overshadows the reality of actual projects, several key developments have set the stage for growth. "A singularly important role for policymakers in Maryland is to establish policy goals and regulatory frameworks that foster innovation in serving local energy requirements – not only with microgrids, but with a full range of demand-side services." 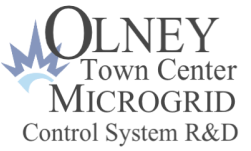 The Division of Energy Resources commissioned the Microgrid Institute Team to perform a study and prepare a report identifying regulatory barriers and opportunities for microgrid development. The study specifically considers energy assurance and renewable energy integration, with a policy roadmap to facilitate microgrid development. The study was made possible by a grant from the U.S. Department of Energy and the Minnesota Department of Commerce through the American Recovery and Reinvestment Act of 2009 (ARRA). Since its release, the report has served as a resource not only for the State of Minnesota, but has been distributed to stakeholders by other agencies and states, such as New York and Connecticut, and by such organizations as IEEE. Michael Burr, United Nations Foundation Minigrids Working Group teleconference, Nov. 21, 2013. Driving forces and barriers for microgrids in the U.S.
Energy Bar Association Webinar presentation, Sept. 25, 2013. Michael Burr, Maryland Clean Energy Summit, Oct. 16, 2013. 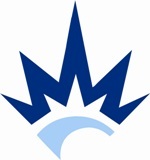 ABA-ACORE Webinar Presentation, July 17, 2013. Microgrid Institute is a collaborative organization that focuses on key issues affecting microgrids and distributed energy resources (DER) around the world. Our efforts address market development and analysis, regulatory and financial models, and project feasibility and structuring. We use a multidisciplinary approach. By working with acknowledged authorities and subject-matter experts, we provide thorough and objective study and analysis. Our key goals focus on supporting market development; addressing key issues that affect microgrid and DER projects; and contributing knowledge, insight, and leadership to project development processes.